1. Rub ribs all over with Memphis Shake. Cover and refrigerate for 2 to 24 hours. Soak wood chips in water for at least 30 minutes before grilling. 2. Soak 3 cups hardwood chips in water for 30 minutes or up to one day. Build a charcoal fire on an outdoor grill to medium heat. Place a pan, half-filled with water, under cooler side grill grate. Open bottom vents grill. 3. Place ribs over drip pan. Drain wood chips and place half directly over hot coals. Rotate lid so vent holes are directly over ribs. Add about 1 cup hardwood charcoals to fire about every hour during cooking time to maintain a medium to medium-low fire (a temperature about 250 degrees F to 275 degrees F is ideal). Cook until meat is reddish brown and pulls back from bones, about 3 hours. Baste ribs with barbecue sauce and cook over direct heat until lightly glazed. 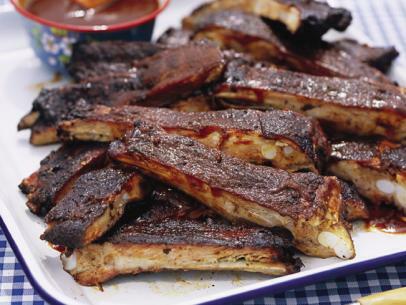 Cut racks into ribs and serve with extra sauce on side. Whisk paprika, brown sugar, oregano, garlic, ancho powder, 2 teaspoons salt, and celery salt in a small bowl. Store in an airtight container in a cool, dry place for up to 2 months. If you like your ribs dry, skip the sauce or simply serve it on the side. For this recipe, we prefer Mexican oregano. It's stronger than Italian oregano, so it can hold its own with the other assertive flavors in this sauce.